Saturday was a great day here in the Cuchara Valley. Early morning was cool and clear with no winds. I drove up to Cuchara Pass Ranch to List a wonderful Country Home (more on that later). 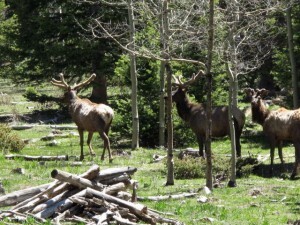 And as I was about to head back down to La Veta, I saw 3 nice elk. What made it so special was this time of the year. 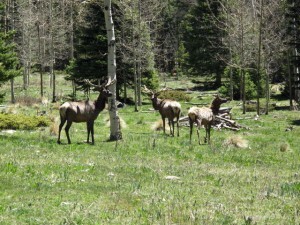 I have seen lots of buck deer in their springtime velvet antlers, but never a bull elk in velvet. They were mossy looking and beautiful. MCLEAN, Va., May 26, 2011 — Freddie Mac (OTC: FMCC) today released the results of its Primary Mortgage Market Survey® (PMMS®), which shows slower economic activity pushing fixed-rate mortgages slightly lower for the sixth consecutive week. The 30-year averaged 4.60 percent; the 15-year averaged 3.78 percent, marking new lows for 2011. 30-year fixed-rate mortgage (FRM) averaged 4.60 percent with an average 0.7 point for the week ending May 26, 2011, down from last week when it averaged 4.61 percent. Last year at this time, the 30-year FRM averaged 4.84 percent. Have been busy and missed some of my blog posts this week. We had our official CLOSING today on the Book Nook building purchase. They made their goal, got their Gates Matching funds and now own their own little building on Main. Our hearty congratulations to them. And we have a Purchase Contract this week on a nice small ranch. I told you about that big price reduction 2 weeks ago. I knew this would go fast now. Still the usual hurdles of contingencies so never a done deal until you leave the closing table with your check. But it looks very promising. Other real estate news can offer interesting suggestions and predictions. Here are a few links you might want to preview. Congrats to Chef Erron Cross and Manager Ward Garbers for their succesful re-opening weekend at the Timbers in Cuchara. Our weekend ended on another nice weather note of mostly cool and clear. More rain showers predicted for early part of this week. Memorial Weekend looks to be sunny and dry for all the outdoor activities. Art Gallery Open Houses this next Saturday and the following week includes a Box Social Fundraiser, a fishing derby and horseback riding on La Veta Pass the following week. More details on these great activities will follow. Two big Friday night events here in the Valley. Formal opening of Timbers Restaurant at Cuchara tonight. We were honored to attend a small pre-opening shakedown trial last night and enjoyed one of the nicest dinners we have had in some time. Wonderful food and service. Give it a try real soon. Last Open Mic night of the season is also tonight at the Parkside in La Veta. The entertainment has been fabulous of late. You won’t want to miss out on this one. So to cover both venues, I recommend that we all draw a number and you even numbers go up to the Timbers and the odd ones go to Open Mic. Don & Andy Ayers will be kicking off their 2011 season this weekend in Cuchara. The newly redecorated and refurbished Timbers Restaurant opens on Friday evening. Award winning Chef has delightful cuisine surprises. These new Price Reductions will be of interest to many of you. Treasurer update for the Book Nook Winefest reports that over $3,000 was raised. Yippeee. They are easily within reach of the building fund goal. Thank you each and all for your local support.